State TTT Championship 2018 : Team Aggress! Race Held on I-10 Frontage Road at Picacho Peak, Arizona. From Tucson take I-10 north to exit 219 then follow signs to parking. From Phoenix take I-10 south to exit 219 then follow signs to parking. Parking We will use the parking areas next to the Bowilin Travel Centers. This is the big over night parking area for the trucks on the west side of the NEW Bowilin Travel Center. Not by Dairy Queen..
A flat out and back time trial with 20 k and 40 k options. The course is out and back with 150 feet of elevation change, straight with one turn. At the start line the day of the race starting at 6:00 AM going until the last rider picks up their number! Find the Aggress Tent in the parking lot west of the Bowlin Travel Center on I-10 Frontage Road. All riders must sign the release form. Teammate can pick up teammate number with a per-printed signed release form and a copy of the riders license. The start list and start time with rider number will be posted on the Aggress web page Friday, August 17, 2018 around 12 PM (Noon). First Rider Starts at 7:00 AM. Two-minute intervals between Teams. Approximately 20 Minute gap between the junior’s and the 40K teams. 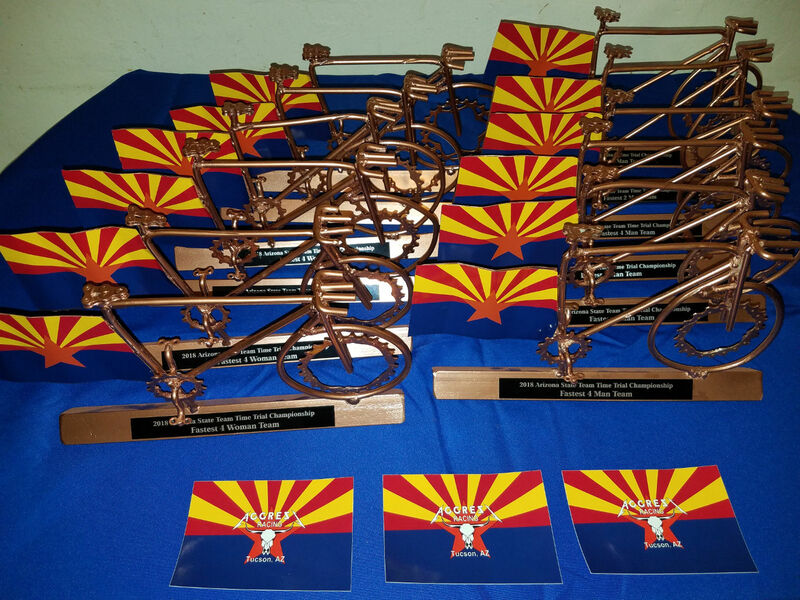 Awards USA Cycling State Championship medals will be awarded to the top three teams in each category that hold yearly racing licenses. Trophies for the fastest male and fastest female teams! Teams with any one-day licenses holders are not eligible for State Medals or State jerseys. The event is keeping the fees very low so this year. Team Aggress will not be purchasing the Arizona State Championship Jersey for the winners. However each team category winner has the option to purchase a jersey from Voler Wear through Aggress for $50. Time will be taken on the third cyclist to cross the finish line. All riders will be given the same finish time. When picking up numbers all riders must be present and all release forms signed before a number is handed out. “Mandatory junior roll-out at the registration area 15 minutes before race start.” Check in with the race officials by the starting line. All USA CYCLING Rules apply. Course closes at 6:30am. Any racer warming up on the course after the race starts will be disqualified. No Exceptions. Can a team register with only 3 riders? YES! Teams consist of a minimum of 3 and a maximum of 4 cyclists. Time is stopped on the 3rd cyclist. Do all 4 cyclists have to be on the same ABRA team? NO, cyclist can come from different ABRA teams, Non-ABRA teams or be unattached cyclists. Do all team members have to wear the same jersey? YES. If you have a member from another team get them to borrow a jersey. The jersey can be from different year for the same Team. This makes if easier for the officials and it IS a TEAM event. Can unattached cyclist participate in this event? YES, they can be a part of a 4 person team or two person team. What happens if one of the teammate cannot make the race? First the new rider must have an annual USA CYCLING License or one day License. Second the new rider MUST sign the release form and have the license verified BEFORE they ride. The new rider MUST check in BEFORE the team starts. The Team due to the change may change categories based on the new rider, they will keep their original start time and scored with the correct category. No head phones allowed during on road warm up or during the event. Race Number RACE NUMBER: TEAMS EACH RIDER MUST HAVE NUMBER PLACE ON THE RIGHT SIDE OF BACK (or forehead). TANDEMS ONE NUMBER ON THE RIGHT SIDE OF THE STOKER! Course Marking START LINE: White Tape. FINISH LINE: Is about 1 tenth of a mile South of Start with White Tape Line. Going South or outbound each 5 K is marked with a sign. Going North or on the home stretch there are 5 K, 1K and 200 meters signs. “Mandatory junior roll-out at start area!” Check in with an USAC Official. Snacks/drinks/water after race while waiting for results.